UPDATE! 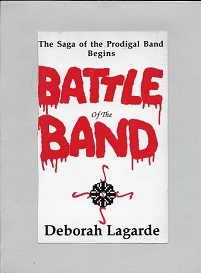 The FREE The Prodigal Band PDF file has been uploaded! Click HERE to DOWNLOAD the FREE The Prodigal Band PDF e-book that you can save to your computer or device. Make sure you have Adobe Acrobat Reader on your device. NOTICE: This book has been copyrighted and has been submitted to and registered with the Library of Congress. While the e-book is free, ANY editing using Adobe Acrobat or any other PDF-creation software, or any theft of any manuscript for the purposes of violating this copyright or using anything in this manuscript for the purposes of piracy or changing any word or artwork in this e-book is strictly prohibited! Taking materials out of this e-book for the purposes of creating any manuscript WITHOUT PERMISSION by the copyright owner will be subject to copyright violation and subsequent litigation. Violators will face litigation under the rules of the Library of Congress or the Digital Millennium Copyright Act (DMCA). 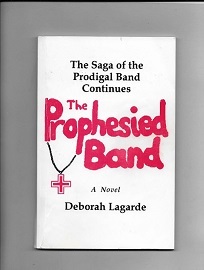 The Prodigal Band is © Deborah Lagarde, 2018. Rights Reserved. “If dead rock stars could talk,” a man in a trench coat muttered. A private 747 jet began its descent into Heathrow Airport, originally from Dallas, Texas. Six male passengers—members of Sound Unltd, ‘the greatest rock band ever’—sat aboard. Twenty minutes later, the plane landed. Trenchcoat, standing behind an aluminum wire mesh fence close by, didn’t know that. Kaboom! The jet’s passengers cabin burned—outside the jet it sounded like some small explosion—less than a minute later. He snorted and said to himself, “Sound Unltd? Not anymore, you’re not.” But dammit, he thought, that jet should have exploded in mid-air over the Irish Sea! When police, fire fighters, ambulance crews and the news-and-gossip-hungry media arrived several minutes later, Trenchcoat was safely behind the wheel of his Austin-Healey driving toward the airport’s exit. Through a white void up a long walkway to a heaven-like realm walked the six. Unaware their jet spewed smoke and debris, the sextet knew they were still alive. Bewildered, the young men surveyed the soft, endless whiteness. Barefoot, in white robes. A lead singer with dark brown shoulder-length hair accentuated by sensuous bangs on a baby-face was slender, thin-lipped and of medium height. Voice a Godly gift. Yet, some said, the devil’s tool. The tall, angular-faced guitarist possessed dirty-blond hair now growing on once-shaved sides of his head. Now without the screaming instrument he fired into immortality. The dark, strapping bass guitar player with bushy black hair and dark-coal eyes walked without his trademark gold chains. The tall, lanky, beak-nosed, ringlet-haired album producer and master of many guitars worried over his past perversions. The pot bellied, biker-esque keyboard-synthesizer player famed for red hair wild as the wind, fiery as his brew, bore a downcast of regret. A short, curly-blond percussionist once angered by lost love approached with the others to an unknown destination, glad with a full life behind him. For they knew Who sat ahead. But how would He judge them? After a time, they were dismissed from that heavenly realm, back to the furnace consuming the jet. Back in their casual clothing and shoes. As emergency people entered the once-plush, burning cabin, the fully-conscious band, coughing from sudden surprise smoke, jerked about in their seats, dazed but confused and unhurt, then yelling for help. A short time later the six found themselves literally tossed out of the jet onto foam escape mattresses. Then, disregarding authorities, the reporters and photographers engulfed them. As medics led the sextet toward ambulances, Jack thought. We were on the jet, then we were taken somewhere for I don’t know how long. Then we were back on the jet. Which was burning. Like I’m really going to tell them that. Like they’d really believe God got us outta there in time, took us to some safe place, and, when it was safe enough on the plane, He sent us back here. But I believe it, and, soon enough, the bastards that did this will believe it, too. Torquay will believe it! That evening Trenchcoat figured he’d give the varied news media time to coordinate their spin machines before he turned on his television and checked in to what he knew would be the major story of the evening—the mysterious explosion that engulfed Sound Unltd’s private 747 jet, killing the six. After all, he’d placed the bomb inside a compartment under a cushion of one of the cabin seats while the aircraft was refueling in Philadelphia. One of the band, synthist Bryan McClellan, sat five inches away from the bomb most of the way across the Atlantic and didn’t suspect a thing. “Six o’clock. Time for the show.” Smiled. Short laugh. The dark-skinned man sat in an easy chair in the living room of his mews apartment, got the remote control off a lamp table and punched the play button. BBC-1 came on with a well-known newscaster, the main event in progress. Total, unmitigated shock struck his being. That easy chair shot forward. His heart pounded, matching the beating he gave the arm of his chair. His heart leaped. Picked up the phone knowing who it was. “Yes,” the bomber answered, trying to sound cool and collected. Hung up. But he had no time to think about that call. Surrounded by the rest of the band and management personnel, Jack spoke the same live from the airport’s medical clinic. The media circus over, Sound Unltd met privately outside the clinic with their manager, Joe Phillips, in Phillips’ limo. For Phillips’ real name was Joseph Phillip Torquay-Lambourgeau, son of Baron Torquay-Lambourgeau of the same international banking cartel and the power behind many thrones, presidents and premiers, as well as the Novordo Club, the international elite that wanted to rule the world with impunity. The others snorted in agreement. “You mean God? Actually lifted you up to heaven? You’re not serious.” Joe tried to keep the scorn off his face. Phillips was a confirmed agnostic. They then described the whiteness, the calmness, the heavenliness. “Are you sure it was heaven and not a UFO?” Joe asked sincerely. Joe still had doubts, but he conceded they weren’t lying about what they saw and heard. No foul play? I thought. Why would anyone even conjecture that, except to make the news more entertaining? But one thing that I, Lloyd Denholm, Rolling Stone’s lead freelancer, had come to believe was that in these crazy times where there were zillions of pop recording artists, and industry power was concentrating in as few hands as possible, that nasty play against the world’s leading per- unit-sales recording act, who were music moguls themselves, was close to a hundred percent likely. No foul play? I smelled a cover up. Since the band trusted me, Rolling Stone assigned me to investigate this event. Which would turn into a series of events. Foul play, indeed.